The Archwood gets its name from the gentle yet dramatic curves that frame the doors and windows of the structure. Inspired by familiar elements of contemporary home design, the Archwood can increase the beauty of a recently built home, or update an older model while enhancing its charm. This 13 foot Archwood was stained white with a solid bodied stain to match the exterior finish on the house and garage. 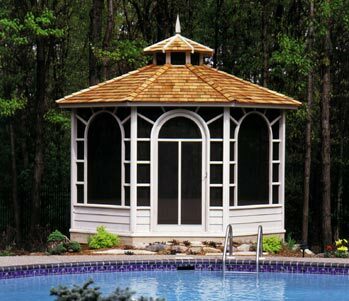 This gazebo serves as a pool house for the owner, offering a semi-private changing area and shelter for swimmers when the sun gets too hot.